Pottery has always been something that has interested me. When I was in connection with Reagan to come to her studio to photograph her at the wheel, I was thinking about so many life-parallels about her as an artist, molding the clay. I was also thinking about how soothing and relaxing this type of expression must be, and how satisfying I imagine the feeling when your piece is finally finished, having been processed through each stage, and finally ready to be on display. 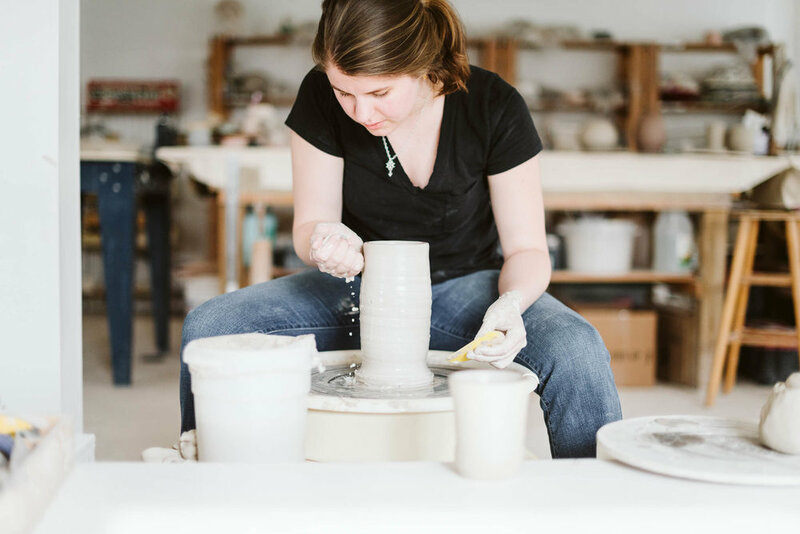 I met Reagan at her resident studio in Lancaster, Pennsylvania - Lancaster Clay Studios, where you can take class or even rent a space to do your own work. The lighting inside was beautifully crisp and clean, with white walls and pottery materials tucked into every corner. Some of the artists' finished pieces are shown on display when you walk in too, which were fun to look at and see all the different styles of work. I loved Reagan's pour-over coffee cups and some of another artists' hanging planters. As she worked, I asked Reagan questions about where she was from and what got her started in pottery. She grew up in northern Virginia and settled in PA after college with her husband of three years. 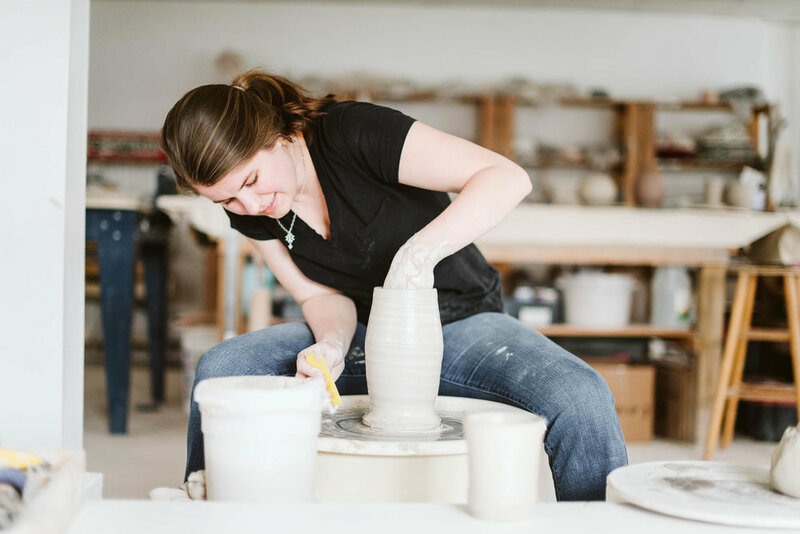 She had taken a pottery class in high school and fell in love with it. 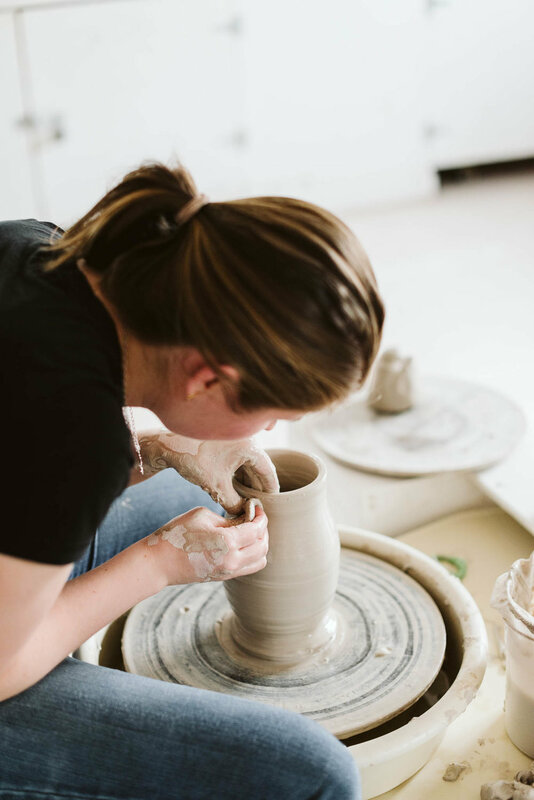 She loves to make the pour-over mugs but has recently been making more vases, and has a few projects going with some local florists. 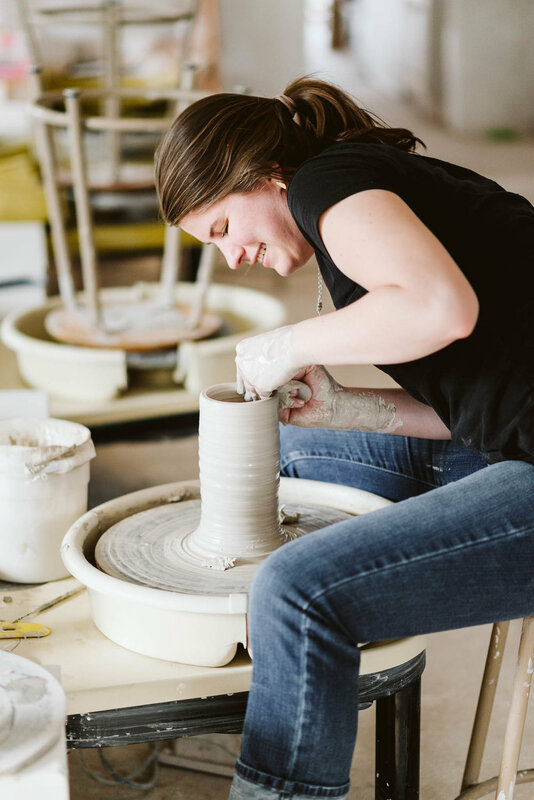 First, she starts with a weighed-out chunk of clay and kneads and works it a big until it's malleable enough to throw onto the wheel. Then, once it's on, she has a petal she pushes with her foot, similar to a sewing machine, that spins the wheel while she molds it with her hands. 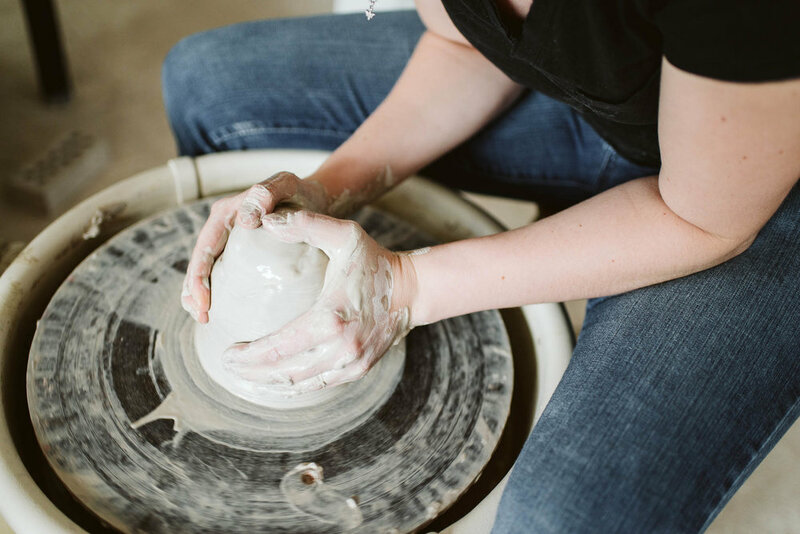 It's important to feel the clay as it spins, not only to shape it, but to make sure there are no air pockets or bubbles in the clay. 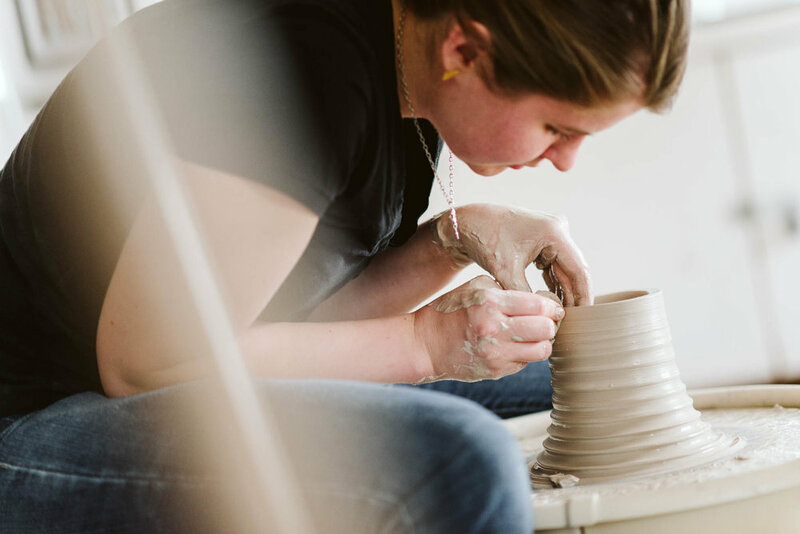 She also has to make sure the clay contains just the right amount of moisture so that it doesn't crack but isn't too wet to topple over or deform. She worked on a little mug and then a vase while I was there. The tools in the box you'll see are for "trimming". After the clay piece has been formed and dries out, it gets trimmed and perfected before going into the kiln for firing and then glazing. It was such a pleasure to meet Reagan. She's so down to earth and conversational, and has such a talent for sure. Her work can be found and purchased at reaganashleypottery.etsy.com.